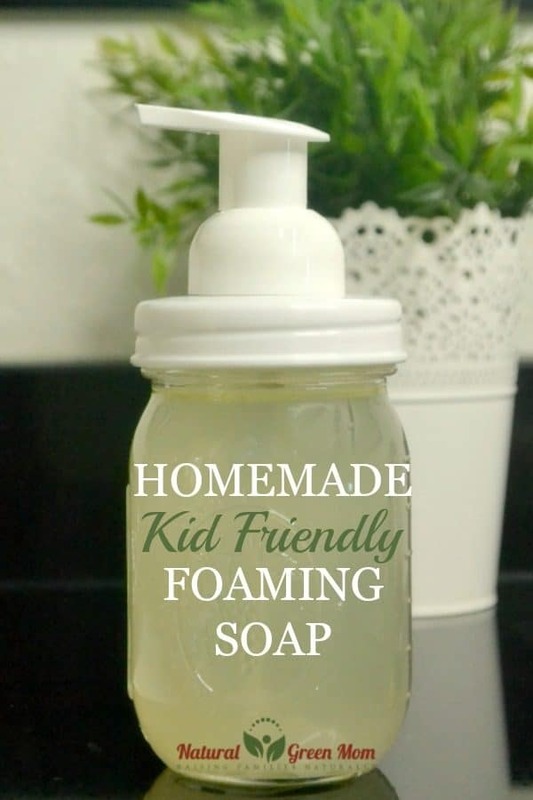 Homemade Kid-Friendly Foaming Hand Soap – Two easy and economical recipes. We’ve all heard the advice: to keep your kids from getting sick, they need to wash their hands frequently. For a long time, we were told to use antibacterial formulas when washing our hands. Then we discovered those same antibacterial formulas were actually making us sicker! Thankfully, we finally banned toxic triclosan from our hand soaps. Why did we ever need triclosan in the first place??? Did you know, you can get the same antibacterial properties by using essential oils in your foaming soap? To get foaming hand soap, you will need a special foaming hand soap dispenser. A foaming dispenser adds just the right amount of air to your formulation to give you that foaminess. I love my mason jar style dispenser but you could probably find a dispenser you like at Target or Walmart. WARNING: Make sure you pick a glass dispenser – not plastic. Certain essential oils will react with plastic, so glass is the best choice. My soap dispenser holds approximately 1 cup of liquid. Therefore, I measure out 1/4 cup of Castile soap and add it to the dispenser. I then add 3/4 cup of water. I add the drops of essential oils before shaking vigorously to mix all the ingredients. Since you’re only using a 1/4 cup of Castile soap at a time, one bottle will last you for months! It truly saves you money. Bergamot – Bergamot has a lovely citrus scent. It’s great for teens who have oily skin and tend to touch their face. Lemon – Clean smelling, lemon essential oil also boosts immunity. Lavender – Lavender is known for its soothing scent. Plus, it’s another immunity booster. FYI: I may not be a kid, but I love the lemon essential oil version next to my kitchen sink. The lemon is a miracle worker when it comes to getting onion and garlic scent off your hands! Follow the same directions for the foaming hand soap above. Measure out 1 part soap and 3 parts water and add to the dispenser. Next, add the drops of essential oils and the 1 tablespoon aloe vera gel before shaking vigorously to mix all the ingredients. 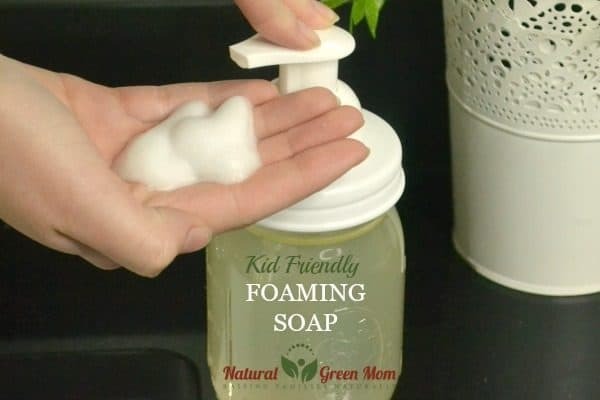 Making your own kid-friendly foaming hand soap is a great way to naturally support your family’s health. It’s quick and economical too! Made this with the aloe Vera, lemon & lavender EO’s. Is it normal to see little bits in there? Does the lemon unsuponify the castile soap or is that normal? Could it be the unmixed aloe?